“Terror, violence, death — they are the midwives that bring free nations into this world,” a leader in the militant Zionist group the Irgun, explains: “I don’t know of one nation, either now or in the past, that was not born of violence.” Israel is to be no exception. 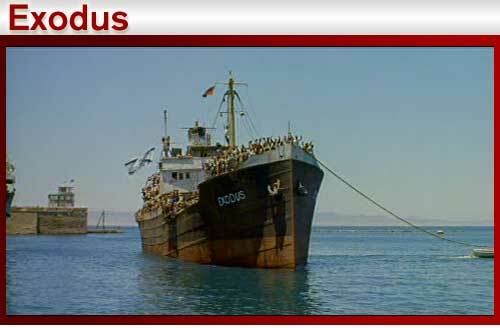 Based on the international bestselling novel by Leon Uris, Exodus takes its name from the 1947 ship whose mission of carrying Jewish refugees from Marseilles to Palestine was thwarted by British forces who boarded the ship at Cyprus, meeting a violent resistance from its passengers. The ship was towed to Haifa, its passengers deported back to France, where they refused to disembark. In the end, the refugees were sent back to Germany and forcibly taken by British soldiers to refugee camps. The critically acclaimed film follows the commander of the Exodus, underground Israeli officer Ari Ben Canaan, played by a dashing young Paul Newman, as he fights to establish a Jewish homeland. With Ari as their leader, 600 Jews are willing to risk everything to set out for the Holy Land. Linking twentieth-century events to an ancient Biblical narrative, Exodus sets itself up as a modern parallel to the Jewish flight out of Egypt, where Ari plays Moses and asks the British to ‘let my people go,’ so that the huge freighter, stuck in the Cyprus harbor, can make its way to Palestine. Filmed on location, Exodus offers breath-taking panoramic shots of the rocky, olive tree covered hills of Israel. Visually spectacular, the film captures the Middle East’s winding country roads, the endless sky, and the open sea—it’s not surprising that the cinematographer was nominated for an Oscar. Unified by their language and tradition, Jews felt they needed their own land, where anti-Semitism wouldn’t be an issue and the ruling government wouldn’t find them threatening.